Stung by Liverpool's heartbreaking 2014 Premier League campaign, captain Jordan Henderson insists the Reds are ready to win trophies ahead of their Manchester United showdown. Not since 1990 have Liverpool won a league title, though the Reds came agonisingly close in 2014 when they were top of the table in April but Steven Gerrard's infamous slip and a 2-0 defeat at home to Chelsea proved their downfall. 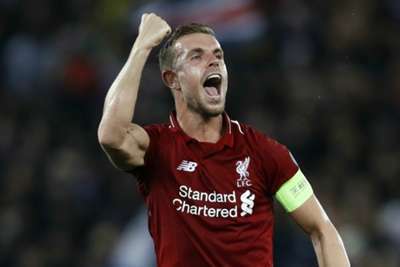 Liverpool's capitulation has not been forgotten by star midfielder Henderson, who said via the Telegraph: "That is something I have had to live with. "But we are years on here, a totally different squad of players and totally different scenario. "I don't like to look too far back into the past. All I'm focused on is to keep winning games for this football club, as many as we can, to be successful and to end up winning trophies." "The lads that haven’t been playing have been coming in and doing a really good job as well – everybody is fighting for their place." "I think that can be really healthy if you use it in the right way." "I feel we're ready," Henderson continued. "We definitely have the potential to win trophies. "I have every confidence with the talent that we've got and the people in the dressing room that we can go and produce trophies in the very near future and hopefully it’s this season." Liverpool have not beaten United in the Premier League since 2014, though Jurgen Klopp's men are overwhelming favourites to end that drought with Jose Mourinho's side managing just one victory from their last five league fixtures. "It's extra special. Liverpool v United is a big game all over the world," Henderson added. "They're a world-class team with a world-class manager. "They've got some world-class players and I'm not even sure when we last beat United in the league…Probably when you look at the table, you are a little bit surprised that they are not doing as well as they can be. But that doesn't mean they are less of a threat."